Hogwarts can get a little chilly! Most witches and wizards don’t really mention that about the school, but it’s true! That building is centuries old and all the magic in the world can’t fix poorly insulated walls and an archaic heating system. Of course, Ravenclaw Tower is especially vulnerable to heating problems… which is why many of the Ravenclaw students take extra measures to help keep cozy during the winter months of the season. 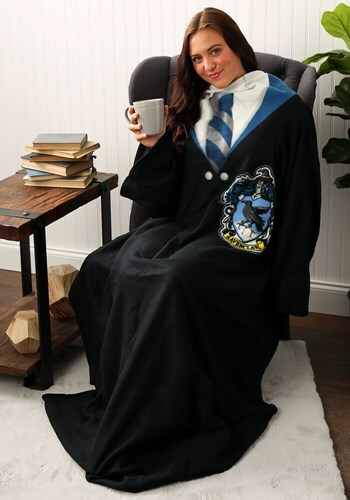 They’ve combined their iconic house robes with the comfort of a cozy blanket to create this warm and toasty throw that’s perfect for any cold winter in Hogwarts. This Ravenclaw comfy throw is officially licensed from the Harry Potter movies. It’s made out of an ultra-soft fleece fabric and has printed graphics on the front to make it look like a Hogwarts uniform. It has sleeves on each side, so it’s completely wearable while you’re warming up by the fireplace. You can wear this comfy throw during your next Harry Potter marathon or you can use it as a casual way to cosplay as Luna Lovegood. Its comfortable design makes sure that you’ll be feeling warm no matter where you go wearing this Ravenclaw throw.